FIGURE 3.45 Intercalary glomalean chlamydospore (Devonian). Bar = 70 |im. 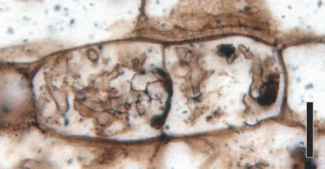 The fossil record of Glomeromycota is believed to be ancient, extending well back into the Paleozoic. 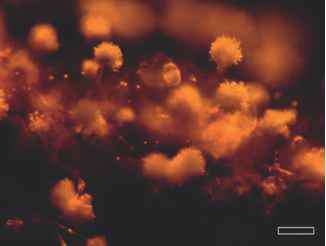 Spores and hyphae of a glomeromycotan type have been reported from rocks as old as the Cambrian (Pirozynski and Daple, 1989), and from 460-455 Ma Upper Ordovician rocks (Redecker et al., 2000). 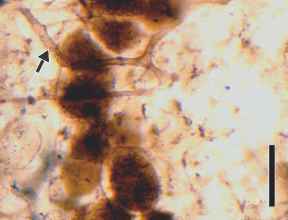 Palaeoglomus grayi has aseptate (coenocytic) hyphae and spores that resemble living Glomus spores (Redecker et al., 2002). In these reports, however, there is no association with land plant remains, and thus the symbiotic association of these fungi remains unresolved. 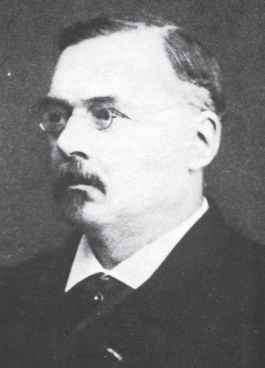 In addition, Butterfield (2005) noted that the very simplicity of these organisms does not provide enough diagnostic characters to separate them from other protists or parasites. 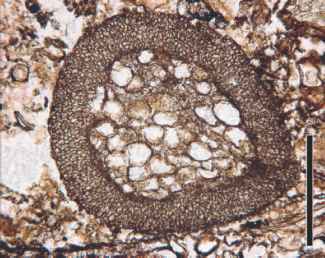 FIGURE 3.46 Detail of mycorrhizal arbuscule zone (dark band) in Aglaophyton (Devonian). Bar = 325 ^m. FIGURE 3.48 Section of Aglaophyton major axis showing cortical cells and hyphae (arrows) of Glomites rhyniensis in intercellular spaces. Bar = 32 pm. FIGURE 3.49 Vesicles and hyphae in Nothia aphylla axes. Bar = 100 pm. functioning as an endomycorrhiza, N. aphylla displays an alternative mode of colonization by endomycorrhizal fungi, which may be related to the peculiar internal anatomy of the rhizomatous axis. In this part of the axis of N. aphylla , the cells are arranged in radial rows with virtually no intercellular spaces, so perhaps there is no intercellular infection pathway into the cortex (Krings et al., 2007a, b) this part of the axis of (see Chapter 8 for additional data on N. aphylla). FIGURE 3.50 Arbuscules (arrows) in gametophyte of Lyono-phyton rhyniensis (Devonian). Bar = 35 pm. 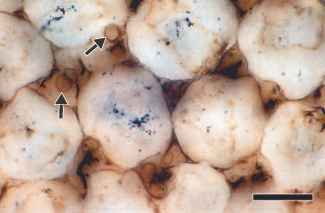 We now know that several of the gametophytes of the Rhynie chert plants were also endomycorrhizal (FIG. 3.50). Although the Rhynie chert does not represent the oldest terrestrial ecosystem, the extraordinary preservation at this site does indicate that the association of plants and certain types of fungi is ancient and, in fact, lends support to the hypothesis that fungi may have been critical in the early colonization of land by plants (see Chapter 6; Pirozynski and Malloch, 1975). organs such as Stigmaria, the underground organ of the arborescent lycopsids; in other cases they are solitary within the matrix. Spores of this type range from 100-400 pm in diameter and possess a multilayered wall. Many are preserved attached to the hyphae that produced them, and, in some specimens, the attachment area is structurally identical to those seen in modern endomycorrhizal fungi like Glomus. 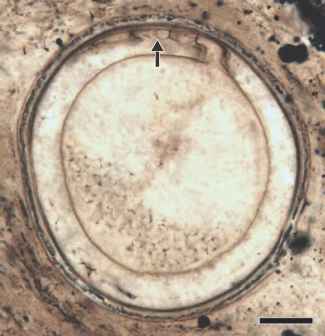 FIGURE 3.53 Scutellosporites devonicus showing germination shield in cross section (arrow) (Devonian). Bar = 50 pm. pleisomorphic character, its discovery in the Rhynie chert is important as a direct marker for calibrating molecular clock hypotheses on endomycorrhizal fungi. FIGURE 3.55 Arbuscule in root ofAntarcticycas(Triassic).Bar = 25 pm. 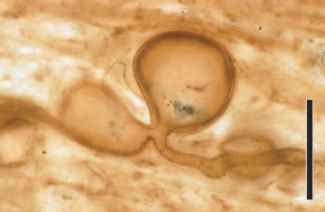 FIGURE 3.56 Chlamydospores of Sclerocystis sporocarp (Triassic). Bar = 15 pm. information that may be useful in tracing the evolution of the important nutrient-exchange structure, the arbuscule. The ascomycetes, or sac fungi, are the most diverse clade of living fungi, with more than 40,000 species. In recent phyloge-nies, the group includes three subclasses: the Taphrinomycotina, an early-diverging clade, the Saccharomycotina (the yeasts), and the Pezizomycotina, which includes the vast majority of the multicellular ascomycetes. 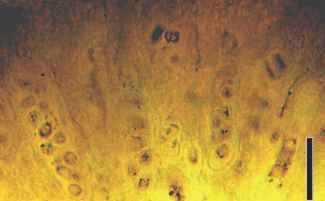 The clade includes both single-celled (yeasts) and filamentous forms, and the hyphae of the latter are septate. Sexual reproduction is characterized by an ascus (pl. 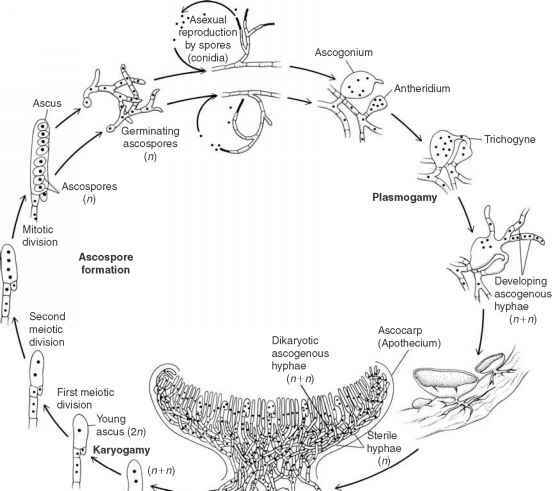 asci), a sac-like sporangium in which nuclear fusion (karyogamy), followed by meiosis, take place, leading typically to the production of 4, 8, or 16 ascospores (FIG. 3.57). Asexual reproduction occurs by fission, fragmentation, or the formation of asexual spores. Ascomycetes are worldwide in distribution and can be found in a wide variety of habitats, today and in the past (White and Taylor, 1988). Several important pathogens today are ascomycetes (e.g., chestnut blight, powdery mildews, ergot), as well as the edible truffle. Some ascomycetes form symbiotic associations with certain algae and/or cyanobacteria to form lichens. The Ascomycota are regarded as sister to the Basidiomycota based on morphological and molecular phy-logenies (Blackwell et al., 2006). 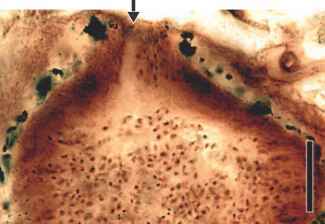 Morphological features that ally them with the basidiomycetes include the segmentation of the hyphae in the form of cross walls (septa, sing. septum), pairs of unfused nuclei after mating and before nuclear fusion, and structures in both groups that coordinate simultaneous mitosis of the two nuclei. Molecular clock analyses (Taylor and Berbee, 2006) and recent fossil evidence indicate that the Ascomycota are far older than once believed. 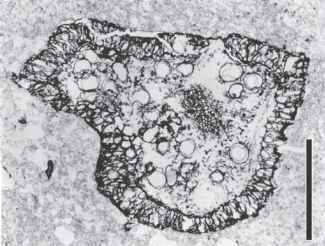 The earliest fossils attributed to the Ascomycota are specialized cells (phyllides) macerated from middle Silurian rocks of Gotland, Sweden (Sherwood-Pike and Gray, 1985). 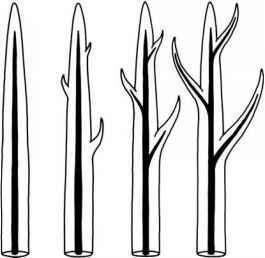 These remains consist of tubular filaments with perforate septa; on some filaments the surface is ornamented by short branches (FIG. 3.10). Multiseptate spores with 1-9 cross walls occur in the macerates as well (FIG. 3.11). Evidence of ascomycetous fungi has also been reported on the cuticle of the Devonian enigmatic thalloid plant Orestovia devonica from the Early Devonian of Siberia (Krassilov, 1981a), including haustoria, hooked hyphae, and asci. One of the best-preserved examples of an early ascomyc-ete is Paleopyrenomycites from the Rhynie chert (Taylor et al., 2005b). Specimens of P. devonicus occur as perithecial ascocarps just beneath the epidermis of the vascular plant Asteroxylon mackiei (FIG. 3.58). Perithecia are spherical with a short ostiolate neck (FIG. 3.59), and asci and paraphyses (sterile, hair-like filaments) line the inner surface of the asco-carp. Each ascus produces up to 16 ascospores (FIG. 3.60) with 1-5 cells each. In addition to the presence of the sexual (telemorphic) stage, P. devonicus is also known from tufts of conidiophores that are interpreted as the asexual (anamor-phic) component of the life history. 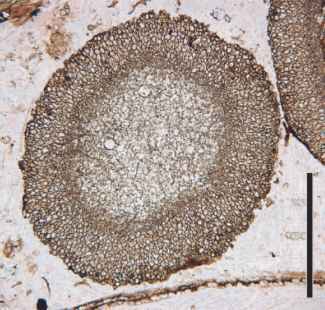 The presence of both phases makes P. devonicus one of the most completely known fossil fungi. Taylor et al. (2005b) noted that the features of this fungus compared with those in several extant groups (e.g., Xylariales in the Sordariomycetes); a cladistic analysis was not able to clarify relationships. The extraordinary preservation of this Early Devonian ascomycete should help to define character evolution in the ascomycetes, as well as serving as a benchmark in tracing the evolution of major lineages within the Ascomycota (Taylor and Berbee, 2006). 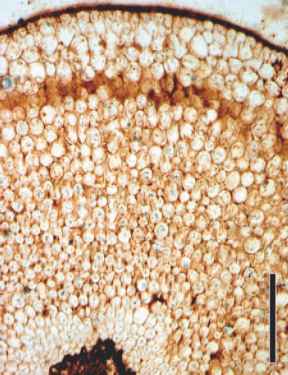 Mycokidstonia sphaerialoides is another Rhynie chert fungus interpreted as an ascomycete (Pons and Locquin, 1981). They describe ascomata (fruiting bodies that give rise to asci and ascospores), which are spherical and ~ 175 pm in diameter, but these structures share features with chytrid zoosporangia, so the attribution to the Ascomycota is not certain. FIGURE 3.58 Section of Asteroxylon mackiei enations showing position of several Paleopyrenomycites devonicus perithecia (Devonian). Bar = 10|im. 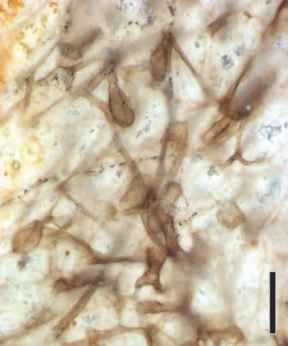 FIGURE 3.59 Section through ostiole (arrow) of perithecium of Paleopyrenomycites devonicus and numerous ascospores in cavity (Devonian). Bar = 60 |im. 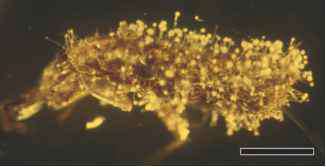 FIGURE 3.60 Several asci containing ascospores from Paleopyrenomycites devonicus (Devonian). Bar = 15 pm. 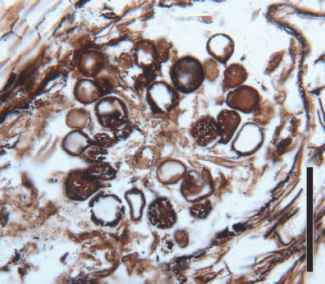 surrounded by a zone of pseudoparenchymatous tissue (FIG. 3.61). What is especially interesting about P. pusillum is that it appears to exhibit a combination of characteristics of several extant fungal groups. Within the cleistothecium are what have been interpreted as asci (FIG. 3.62) containing a variable number of spores (4-8). Hyphae possess dolipore-like septa and clamp connections, features typical of basidiomy-cetous fungi, but also found in other groups (McLaughlin, 1976). The taxonomic affinities and nutritional role of this interesting fossil have been variously interpreted (Dennis, 1976). Some regard it as a fungus intermediate between Ascomycota and Basidiomycota (McLaughlin, 1976), whereas others see it as an ascomycetous fruiting structure closely related to the Eurotiales, which has been parasitized by the mycelium of a basidiomycete (Singer, 1977). The Eurotiales are an order of ascomycetes that includes the sexual stages of Penicillium and Aspergillus, with the latter found in Baltic amber from Russia (FIGS. 3.63-3.65). In another interpretation, Palaeosclerotium is used as an example of a fungus that links the Basidiomycota symbiotically with possible nemat-ophytes (Chapter 6), an extinct group of early land organisms (Pirozynski and Weresub, 1979). 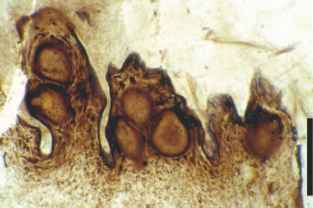 Other fossil evidence of Paleozoic members of the sac fungi include a variety of multicelled fungal spores with thick septa, which have been interpreted as ascomycetes (Kalgutkar and Jansonius, 2000). 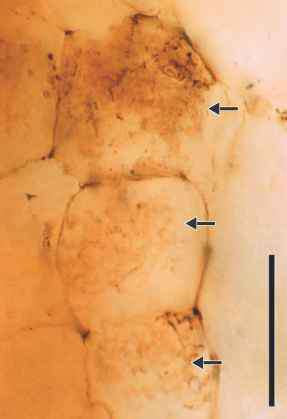 FIGURE 3.61 Palaeosclerotium pusillum showing outer, pseudoparenchymatous zone and central region of branched and septate hyphae (Pennsylvanian). Bar = 500pm. 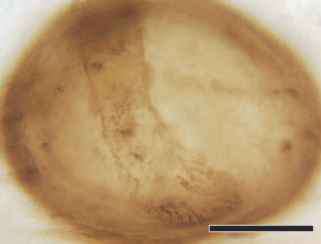 FIGURE 3.62 Palaeosclerotium pusillum with central region containing spore-like structures (Pennsylvanian). Bar = 500 pm. Oligocene-Miocene) and Baltic (55-35 Ma, Eocene) amber contain brown hyphae with tapering distal ends that are identical to the extant sooty mold Metacapnodium (Rikkinen et al., 2003). Today some regard the sooty molds as mono-phyletic based on molecular studies (Reynolds, 1998; Schoch et al., 2006).